We're at the end of our second set of snow days for the year (or should I say season, since technically this is the first snow of 2014?). This one hasn't been as bad in some sense because (a) we aren't having flooring installed, and (b) it ended up not lasting near as long as last time (the last snow day set was nearly 6 days, and towards the end I swear I had worked up a nervous twitch). However, it also should be noted that it is supposed to snow tonight, which means that we may miss school AGAIN. Someone send wine. The problem with the snow earlier this week, is that it was BITTER cold. And by bitter I mean that when Drew went to defrost his windshield two days ago, the defrost spray froze while spraying AND froze to his finger. 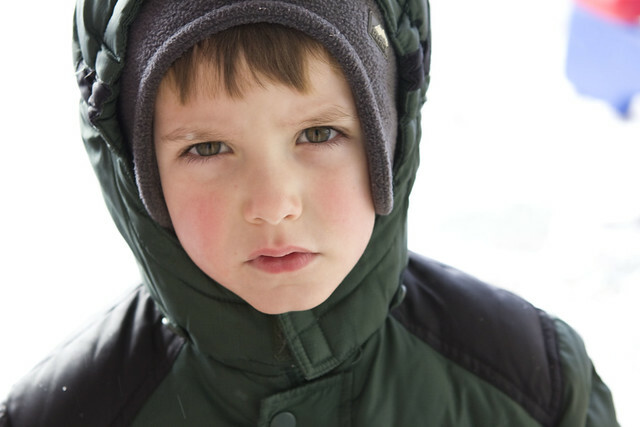 Yeah, aint no child of mine going out and playing in that cold (even if they wanted to). Thankfully the first day it snowed it wasn't extremely bad, so the boys got a good hour of play in to get their snow play out. Connor was ECSTATIC, although he couldn't really understand why they couldn't build a snowman (the snow was so dry since it was so cold, so it didn't compact well). 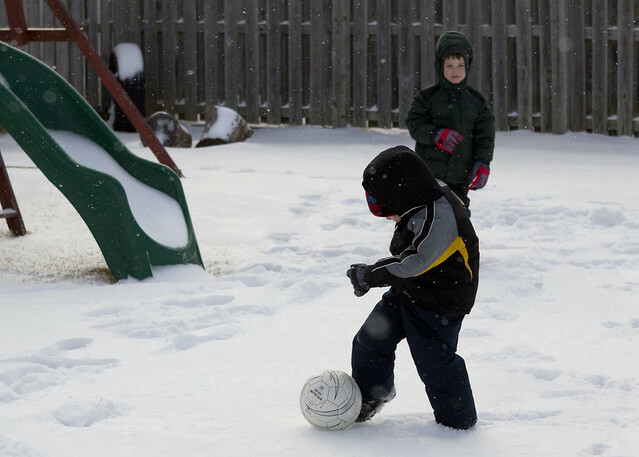 Connor played snow soccer. 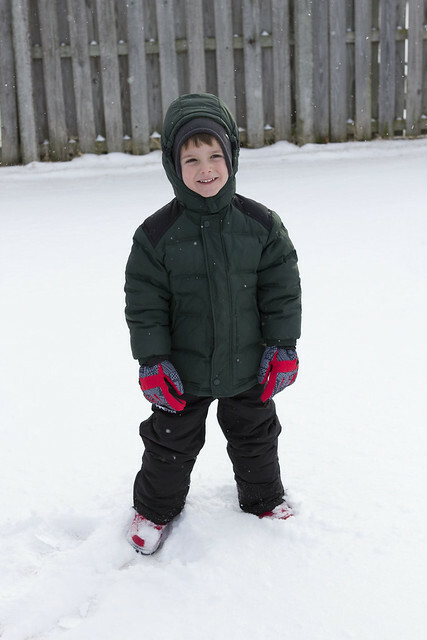 A little hard to be so limber when you're bundled up like the kid on Christmas Story. Connor still showed some pretty valiant speed and agility, all layers aside. Brayden, well, he was happy at first, but after about 5 minutes of the wind whipping his face, he decided he wasn't so sure. he came to the door complaining about his chin strap. Apparently it inhibits yawning. Who knew? 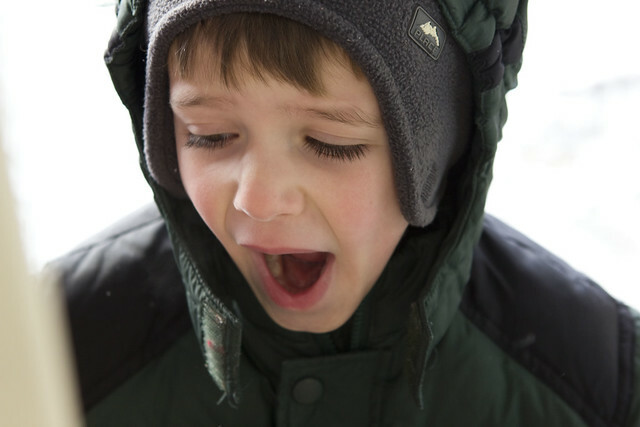 (Also, please note that my child was whining because he couldn't yawn. While playing in the snow. Perhaps this snow was, indeed, boring after all). a few forced yawns and he decided he'd stay outside afterall. 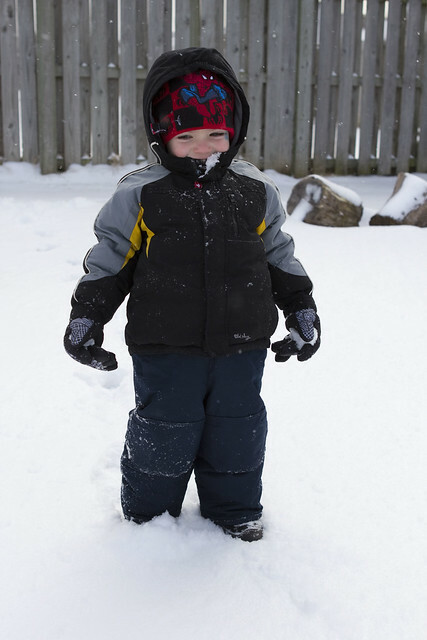 I wasn't able to go outside much because it was just too cold for Tyler, who doesn't have adequate snow gear. I did get to shovel snow off of our front walkway. Shoveling snow is no joke. Schools are already talking about having classes on Saturdays and during Spring break. I'm crossing my fingers that the weather is getting it out now, before my child enters into the elementary age and I will be subjected to awful school regimens of makeup snow days during planned times of vacation.